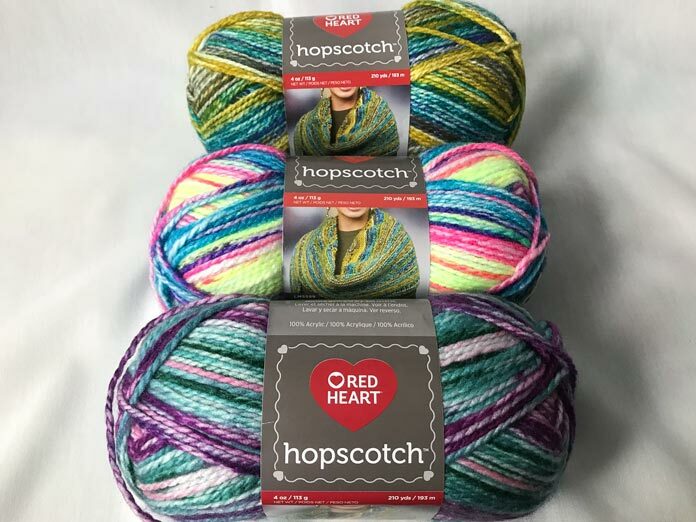 Hopscotch yarn from Red Heart is the perfect yarn for beginner knitters. It’s easy to work with and there are a lot of colors in just one ball to entice! It has everything a beginner yarn needs, the weight is versatile, low maintenance care, and perfect for pairing with other colors. Hopscotch in the color Jump Rope. On KNITmuch, I’ve written several times about pairing your yarn and your project appropriately. This yarn has a lot of different colors in it, so a plain pattern would be the best fit. When I say plain pattern, I mean something that doesn’t have a whole lot of cables or textured stitches. If you do all that work to add in texture, you want your yarn to show that off. This doesn’t mean, however, a busy pattern is totally out of the question. Hopscotch yarn would be amazing for color work. Find a complementary color and do a color work pattern. The Hopscotch yarn will make the pattern look like you’re using a lot more colors than you’re. From front to back the colors Waterslide, Jump Rope, and Kick ball. As I mentioned above the yarn weight is very versatile. 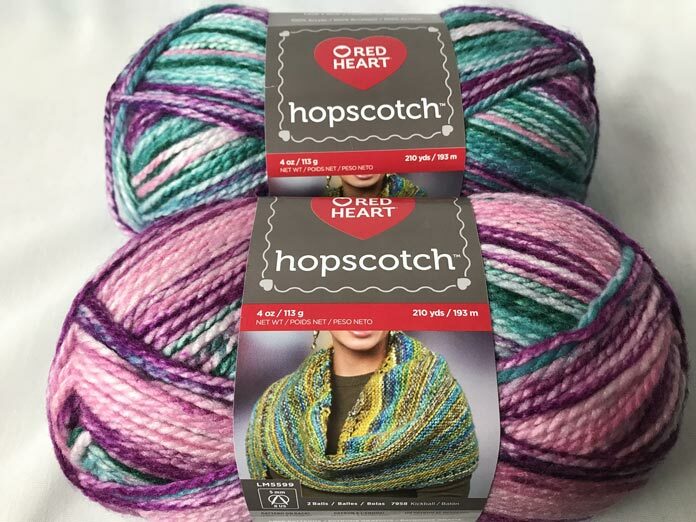 As a medium gauge yarn, there are a riot of different projects waiting in the wings for Hopscotch yarn. Red Heart always has a plethora of patterns to use, but you can also sort them by weight. Just click medium and pick out the pattern that is calling your name. It really doesn’t matter the size of your project either. At $4.99 a ball Hopscotch is a steal! 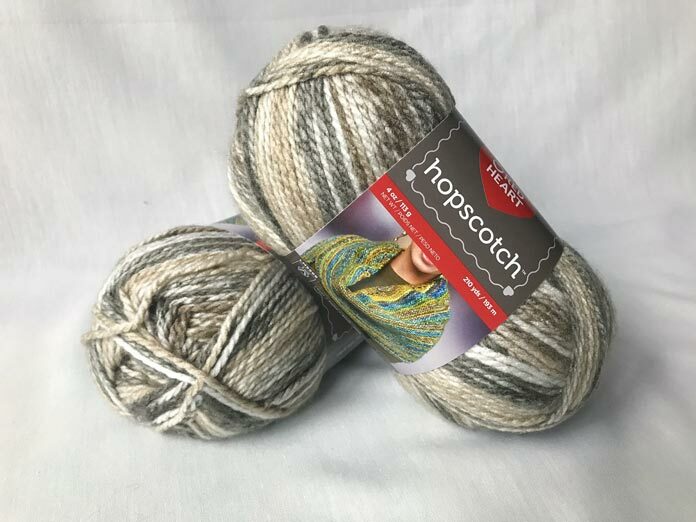 Hopscotch’s neutral color way Somersault. Most hand knit projects meet their demise from improper washing more than the test of time. When you put that much love and work into a garment, it’s really unfortunate to accidentally slip it in the wash or have it felt because the water is too hot. Hopsctoch yarn is 100% acrylic so putting your yarn in the washer and drier is no problem. From personal experience, I have found it takes the truly brave at heart (or the devilishly adventurous) to throw a knitted garment into the drier. If you’re weary of this, or interested in learning more see Charles Voth’s recent article about machine vs. hand washing acrylics. It gives you a great foundation for what’s happening to your knits in the wash. If you’re still not satiated after reading his article, you can always throw caution to the winds and toss a swatch in with your regular laundry. See what happens! That’s what swatches are for. These two balls of yarn are both the Waterslide color way, but they were just wound a little differently. 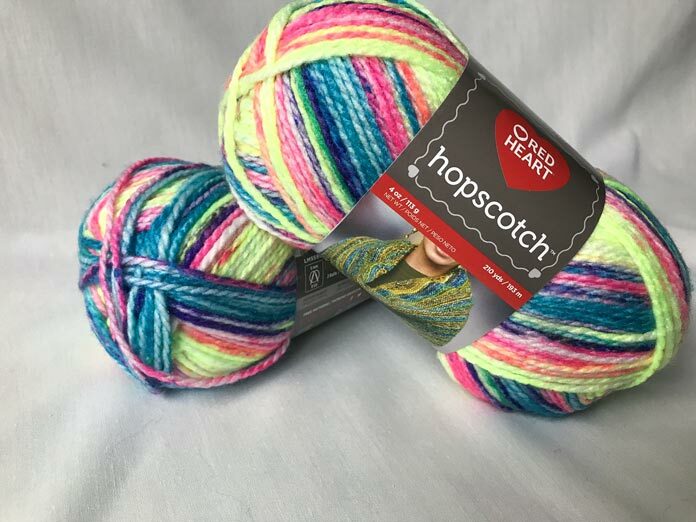 While Hopscotch is the perfect yarn for beginners, seasoned knitters will find we haven’t forgotten about them. You’ll fall in love with the fun and funky color combinations. Hopscotch is an excellent yarn to play around with. Very easy to knit and easy to rip out and knit again if you’re taking risks and trying something new! This is part 1 of 3 in this series.